Flow direction inferred from maps of Vugrinovich (1986) and other workers in the Mid-Continent basins and arches region are paradoxical with respect to developing a conceptual model of flow for the region. 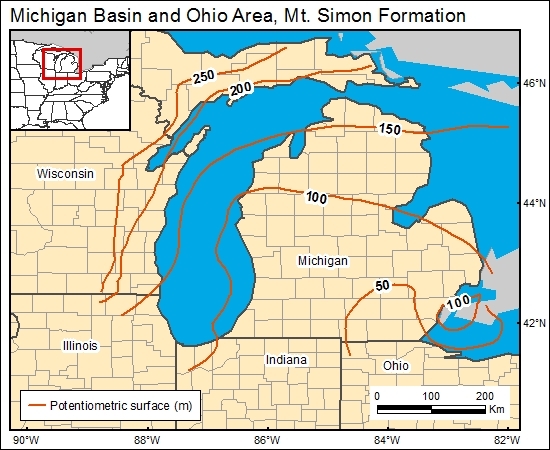 The inferred flow directions from maps based on equivalent freshwater heads have flow moving updip, out of the Michigan Basin, whereas inferred flow directions from maps based on variable-density heads have flow moving downdip into the basin (Gupta and Blair, 1997). Because his map contains the most data points in the Michigan Basin, we have used Vugrinovich's map of hydraulic head for the Mt. Simon.